While everyone else is obsessing over the sudden influx of all things pumpkin (and pumpkin spice), I'm freaking out over all the spooky Halloween craft store goods. Don't get me wrong, I love summer, and I wish this heatwave would never end, but I'm also really excited about Halloween, so I thought I'd revisit these seasonal sweets for today's #tbt. Last year I filmed a little Halloween Haul YouTube video and I quickly touched on all these chocolates before running off to host my Halloween party. 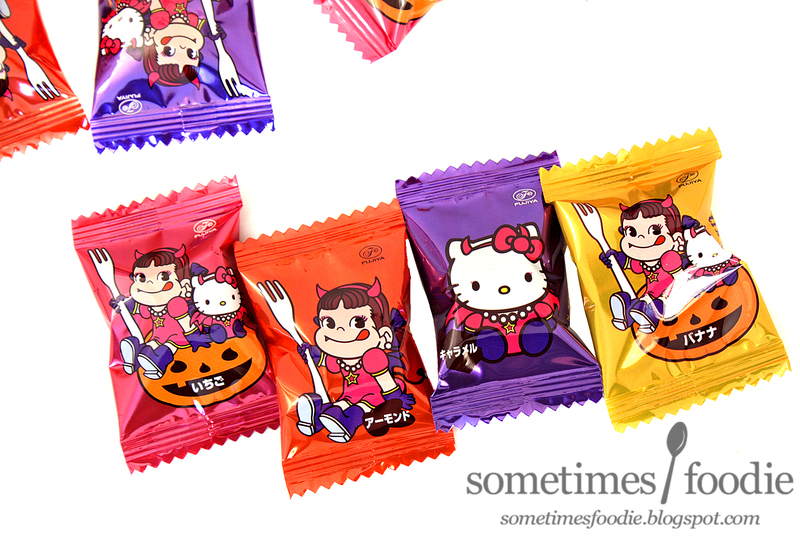 The candies were really cute, and I loved the packaging so...I kind of stocked up on them. I don't even like LOOK chocolate! It's one of the worst tasting Japanese chocolates I've ever had, but it always suckers me in with nice packaging, and this was no exception. How could I resist? Look at this packaging! It's colorful, cute, AND spooky? As the Tumblr kids say, this is my aesthetic. Now here we are, in August. 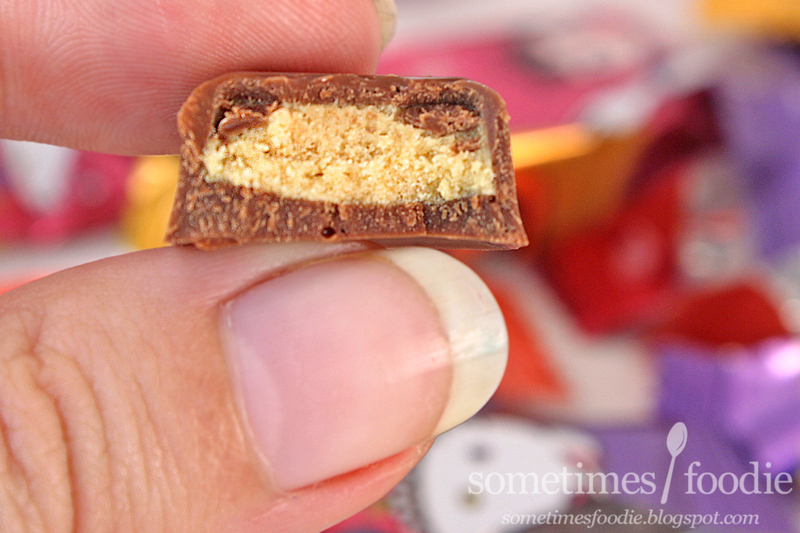 New Halloween candies are hitting the shelves...and I still have a stash of last year's goodies. Whoops. First world food blogger problems, am I right? Well hopefully I'll knock out another bag today. Inside we have 4 different flavors of chocolate. Pink Foil, Strawberry - Smells very similar to the strawberry cheesecake bars from Lindt's Hello line. Sweet and fruity, but artificial. 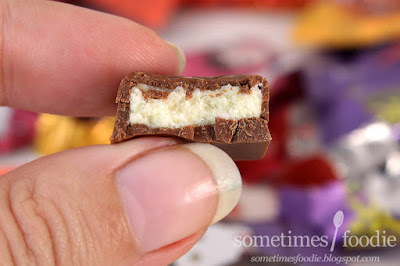 The chocolate is really sweet and slightly waxy, but not terrible quality, and the filling is very soft with a surprisingly light strawberry flavoring. It's not as yogurt-y as the Lindt bar I mentioned earlier, or the coating on strawberry Pocky, but I like that. This is a milder, less obnoxious version of Meiji Apollo chooclates, and although it isn't my favorite, it's one of the more enjoyable strawberry chocolate candies I've had from Japan. Gold Foil, Banana - At first I thought the packaging was hinting that this was pumpkin flavored, but as soon as you open it up this is undeniably banana. It smells AMAZING. Like my favorite Meiji Banana Choco. Aroma-wise, this is my favorite. Sadly, it doesn't taste as good as it smells. The chocolate is sweet and a little waxy, but the banana creme filling is very pleasant. When the two are combined the chocolate overpowers the banana, so I found myself nibbling around it and eating the center on it's own. If this was better chocolate this would have tasted great, but as is, it's just okay. Orange Foil, Almond - Hands down the best flavor of the four. This one smells sweet and chocolatey with a hint of smokey almond. The aroma is complex and a little bitter, but I like that. 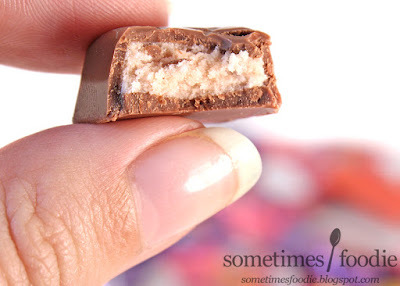 The chocolate is the same quality as the others, but the filling has a fantastic almond flavoring that overpowers it. It's smokey and a little bitter, like roasted almonds, but the overly sweet chocolate blends with it nicely to create a Nutella-like finish and it's delicious. Possibly the best LOOK chocolate I've ever had. 10 out of 10 would recommend, and compared to this one, the others seem even more disappointing. I find myself seeking these out, even though the other wrappers are prettier. Purple Foil, Caramel - Sadly this is another creme-based filling, and not actual caramel. I found the filling of this one to be decent, and far better than the strawberry, but it still isn't great. 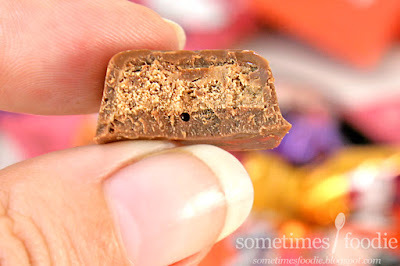 It reminds me of overly sweet milk chocolate mixed with sugar free caramel coffee syrup. 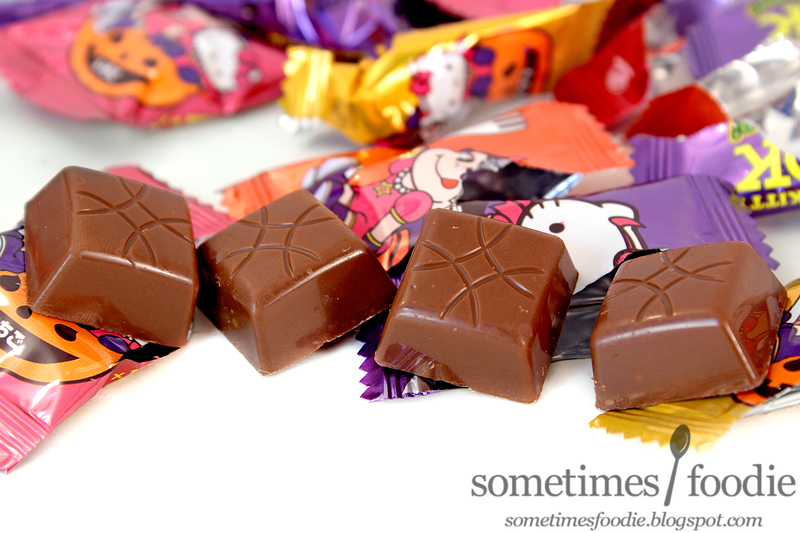 Sometimes it has a deeper caramelized flavor, but most of the candies taste sweet and fake. Not the worst, but it doesn't hold a candle to the almond. If I were grading this product the packaging would get an A++++, but the flavoring would get a C, maybe C+ thanks to the almond flavor alone. These chocolates are not amazing quality, and they aren't truly unique flavors, so unless you're a sucker for all these spooky and Halloween themed (and Sanrio) I'd say these aren't work stocking up on or seeking out. For me, I love the wrappers, and I'd buy them again for display/hoarding purposes.